Glorious Apostle of Jesus Christ, who didst impart his divine light to the nations that were sitting in the shadows of death! we, though unworthy of the name of Christians, address our prayers to thee, that, by the charity which led thee to sacrifice everything for the conversion of souls, thou wouldst deign to prepare us for the visit of the Saviour, whom our faith and our love desire. O God, who by the preaching and miracles of blessed Francis, didst bring into thy Church the people of the Indies; mercifully grant that we may imitate his virtues, whose glorious merits we celebrate. Through our Lord Jesus Christ, thy Son, who liveth and reigneth with thee, in the unity of the Holy Ghost, God, world without end. Amen. The Apostles being the heralds of the Coming of the Messias, it was fitting that Advent should have, in its calendar, the name of some one among them. Divine Providence has provided for this; for, to say nothing of St. Andrew, whose feast is oftentimes past before the season of Advent has commenced, St. Thomas' day [December 21st] is unfailingly kept immediately before Christmas. We will explain, later on, why St. Thomas holds that position rather than any other Apostle; at present, we simply assert the fitness of there being at least one of the Apostolic College, who should announce to us, in this period of the Catholic cycle, the Coming of the Redeemer. But God has not wished that the first Apostolate should be the only one to appear on the first page of the liturgical calendar; great also, though in a lesser degree, is the glory of that second Apostolate, whereby the Spouse of Jesus Christ multiplies her children, even in her fruitful old age, as the Psalmist expresses it (Ps, xci. 15). There are Gentiles who have still to be evangelised; the Coming of the Messias is far from having been announced to all nations. Now, of all the valiant messengers of the divine Word who have, during the last few hundred years, proclaimed the good tidings among infidel nations, there is not one whose glory is greater, who has worked greater wonders, or who has shown himself a closer imitator of the first Apostles, than the modern Apostle of the Indies, St. Francis Xavier. Yes, the life and apostolate of this wonderful man were a great triumph for our Mother the holy Catholic Church ; for St. Francis came just at the period when heresy, encouraged by false learning, by political intrigues, by covetousness, and by all the wicked passions of the human heart, seemed on the eve of victory. Emboldened by all these, this enemy of God spoke, with the deepest contempt, of that ancient Church which rested on the promises of Jesus Christ; it declared that she was unworthy of the confidence of men, and dared even to call her the harlot of Babylon, as though the vices of her children could taint the purity of the Mother. God's time came at last, and he showed himself in his power: the garden of the Church suddenly appeared rich in the most admirable fruits of sanctity. Heroes and heroines issued from that apparent barrenness; and whilst the pretended Reformers showed themselves to be the wickedest of men, two single countries,—Italy and Spain,—gave to the world the most magnificent Saints. One of these is brought before us to-day, claiming our love and our praise. The Calendar of the Liturgical Year will present to us, from time to time, his cotemporaries and his companions in divine grace and heroic sanctity. The sixteenth century is, therefore, worthy of comparison with any other age of the Church. The so-called Reformers of those times gave little proof of their desire to convert infidel countries, when their only zeal was to bury Christianity beneath the ruin of her churches. But at that very time, a society of Apostles was offering itself to the Roman Pontiff, that he might send them to plant the true faith among people who were sitting in the thickest shades of death. But, we repeat, not one of these holy men so closely imitated the first Apostles as did Francis (Xavier), the disciple of Ignatius. He had all the marks and labours of an Apostle: an immense world of people evangelised by his zeal, hundreds of thousands of infidels baptised by his indefatigable ministration, and miracles of every kind, which proved him, to the infidel, to be marked with the sign, which they received, who, living in the flesh, planted the Church, as the Church speaks in her Liturgy. So that, in the sixteenth century, the East received from the ever holy city of Rome, an Apostle, who, by his character and his works, resembled those earlier ones sent her by Jesus himself. May our Lord Jesus be for ever praised for having vindicated the honour of the Church, his Spouse, by raising up Francis Xavier, and giving to men, in this his servant, a representation of what the first Apostles were, whom he sent to preach the Gospel when the whole world was pagan. Francis was born of noble parents, at Xavier, in the diocese of Pampelona. Having gone to Paris, he there became the companion and disciple of St. Ignatius. Under such a master, he arrived at so high a contemplation of divine things, as to be sometimes raised above the ground: which occasionally happened to him whilst saying mass before crowds of people. He had merited these spiritual delights by his severe mortifications of the body; for he never allowed himself either flesh meat, or wine, or even wheaten bread, and ate only the coarsest food; he not unfrequently abstained, for the space of two or three days, from every sort of nourishment. He scourged himself so severely with disciplines, to which were fastened pieces of iron, as to be frequently covered with blood. His sleep, which he took on the ground, was extremely short. Such austerity and holiness of life had fitted him for the labours of an Apostle; so that when John the Third, King of Portugal, asked of Paul the Third, that some of the newly founded Society might be sent to the Indies [India], that Pontiff, by the advice of St. Ignatius, selected Francis for so important a work, and gave him the powers of Apostolic Nuncio. Having reached those parts, he was found to be, on a sudden, divinely gifted with the knowledge of the exceedingly difficult and varied languages of the several countries. It sometimes even happened, that whilst he was preaching in one language to the people of several nations, each heard him speaking in their own tongue. He travelled over innumerable provinces, always on foot, and not unfrequently bare footed. He carried the faith into Japan, and six other countries. He converted to Christ many hundred thousands in the Indies, and baptised several Princes and Kings. And yet, though he was doing such great things for God, he was so humble, that he never wrote to St. Ignatius, the then General of the Society, but on his knees. God blessed this zeal for the diffusion of the Gospel by many and extraordinary miracles. The Saint restored sight to a blind man. By the sign of the cross he changed sea-water into fresh, sufficient, for many days, for a crew of live hundred men, who were dying from thirst. This water was afterwards taken into several countries, and being given to sick people, they were instantly cured. He raised several dead men to life; one of these had been buried on the previous day, so that the corpse had to be taken out of the grave; two others were being carried to the grave, when the Saint took them by the hand, and, raising them from the bier, restored them to their parents. Being continually gifted with the spirit of prophecy, he foretold many future events, or such as were happening in most distant parts. At length, full of merit, and worn out by his labours, he died on the second day of December, in Sancian, an island off the coast of China. His corpse was twice buried in unslaked lime, but was found, after several months, to be incorrupt: blood flowed from it, and it exhaled a pleasing fragrance: when it was brought to Malacca, it instantly arrested a most raging pestilence. At length, fresh and extraordinary miracles being everywhere wrought through the intercession of the man of God, he was enrolled among the Saints by Gregory the Fifteenth. Another account of St. Francis Xavier. A charge to go and preach to all nations was given by Christ to his apostles. This commission the pastors of the church have faithfully executed down to this present time; and in every age have men been raised by God, and filled with his Holy Spirit for the discharge of this important function, who, being sent by the authority of Christ and his name by those who have succeeded the apostles in the government of his church, have brought new nations to the fold of Christ for the advancement of the divine honour, and filling up the number of the saints. This conversion of nations according to the divine commission is the prerogative of the Catholic Church, in which it has never had any rival. Among those who in the sixteenth century laboured most successfully in this great work, the most illustrious was St. Francis Xavier, the Thaumaturgus of these later ages, whom Urban VIII justly styled the apostle of the Indies. This great saint was born in Navarre, at the castle of Xavier, eight leagues from Pampelona [Spain], in 1506. His mother was heiress of the two illustrious houses of Azpilcueta and Xavier, and his father, Don John de Jasso, was one of the chief counsellors of state to John III d'Albret, King of Navarre. Among their numerous family of children, of which Francis was the youngest, those that were elder bore the surname of Azpilcueta, the younger that of Xavier. Francis was instructed in the Latin tongue, under domestic masters, and grounded in religious principles in the bosom of his pious parents. From his infancy he was of a complying, winning humour, and discovered a good genius and a great propensity to learning, to which of his own motion he turned himself, whilst all his brothers embraced the profession of arms. His inclination determined his parents to send him to Paris in the eighteenth year of his age; where he entered the college of St. Barbara, and commencing a course of scholastic philosophy, with incessant pains and incredible ardour, surmounted the first difficulties of the crabbed and subtle questions with which the entrance of logic was paved. His faculties were hereby opened, and his penetration and judgment exceedingly improved; and the applause which he received agreeably flattered his vanity, which passion he was not aware of, persuading himself, that to raise his fortune in the world was a commendable pursuit. Having studied philosophy two years he proceeded master of arts; then taught philosophy at Beauvais college, though he still lived in that of St. Barbara. St. Ignatius came to Paris in 1528 with a view to finish his studies, and after some time entered himself pensioner in the college of St. Barbara. This holy man had conceived a desire of forming a society wholly devoted to the salvation of souls; and being taken with the qualifications of Peter Faber, called in French Le Fevre, a Savoyard, and Francis Xavier, who had been school-fellows, and still lived in the same college, endeavoured to gain their concurrence in this holy project. Faber, who was not enamoured of the world, resigned himself without opposition. But Francis, whose head was full of ambitious thoughts, made a long and vigorous resistance, and bantered and rallied Ignatius on all occasions, ridiculing the meanness and poverty in which he lived as a degenerate lowness of soul. Ignatius repaid his contempt with meekness and kindness, and continued to repeat sometimes to him, “What will it profit a man to gain the whole world, and lose his own soul?” This made no impression on one who was dazzled with vain-glory, and, under pretences, joined false maxims of worldly decency in his idea of Christian virtue. Ignatius assaulting him on the weaker side, often congratulated with him for his talents and learning, applauded his lectures, and made it his business to procure him scholars; also on a certain occasion when he was in necessity, he furnished him with money. Francis, having a generous soul, was moved with gratitude, and considered that Ignatius was of great birth, and that only the fear of God had inspired him with the choice of the life which he led. He began, therefore, to look on Ignatius with other eyes, and to hearken to his discourses. At that time certain emissaries of the Lutherans secretly scattered their errors among the students at Paris, in so dextrous a manner as to make them appear plausible, and Xavier, who was naturally curious, took pleasure in hearing these novelties, till Ignatius put him upon his guard. Some time after this, having one day found Xavier more than ordinarily attentive, he repeated to him these words more forcibly than ever, “What will it profit a man to gain the whole world, and lose his own soul?” and remonstrated that so noble a soul ought not to confine itself to the vain honours of this world, that celestial glory was the only object for his ambition, and that it was against reason not to prefer that which is eternally to last, before what vanishes like a dream. Xavier then began to see into the emptiness of earthly greatness, and to find himself powerfully touched with the love of heavenly things. Yet it was not without many serious thoughts and grievous struggles that his soul was overcome by the power of those eternal truths, and he took a resolution of squaring his life entirely by the most perfect maxims of the gospel. For this purpose, he gave himself up to the conduct of Ignatius; and the direction of so enlightened a guide made the paths of perfection easy to him. From his new master he learned that the first step in his conversion was to subdue his predominant passion, and that vain-glory was his most dangerous enemy. His main endeavours, therefore, were bent from that time to humble himself, and confound his pride. And, well knowing that the interior victory over our own heart and its passions, is not to be gained without mortifying the flesh, and bringing the senses into subjection, he undertook this conquest by hair cloth, fasting, and other austerities. When the time of the vacancy was come, in 1535, he performed St. Ignatius's spiritual exercises; in which, such was his fervour, that he passed four days without taking any nourishment, and his mind was taken up day and night in the contemplation of heavenly things. By these meditations, which sunk deep into his soul, he was wholly changed into another man, in his desires, affections, and views; so that afterwards he did not know himself, and the humility of the cross appeared to him more amiable than all the glories of this world. In the most profound sentiments of compunction, he made a general confession, and formed a design of glorifying God by all possible means, and of employing his whole life for the salvation of souls. The course of philosophy which he read, and which had lasted three years and a half, according to the custom of those times, being completed, by the counsel of Ignatius, he entered on the study of divinity. In 1534, on the feast of the Assumption of our Lady, St. Ignatius and his six companions, of whom Francis was one, made a vow at Montmartre to visit the Holy Land, and unite their labours for the conversion of the infidels; or, if this should be found not practicable, to cast themselves at the feet of the pope, and offer their services wherever he thought fit to employ them. Three others afterwards joined these six, and, having ended their studies the year following, these nine companions departed from Paris upon the 15th of November, in 1536, to go to Venice, where St. Ignatius had agreed to meet them from Spain. They travelled all through Germany on foot, loaded with their writings, in the midst of winter, which that year was very sharp and cold. Xavier, to overcome his passions, and punish himself for the vanity he had formerly taken in leaping (for he was very active, and had been fond of such corporal exercises), in the fervency of his soul, had tied his arms and thighs with little cords, which, by his travelling, swelled his thighs, and sunk so deep into the flesh as to be hardly visible. The saint bore the pain with incredible patience, till he fainted on the road; and, not being able to go any farther, was obliged to discover the reason. His companions carried him to the next town, where the surgeon declared that no incision could be safely made deep enough, and that the evil was incurable. In this melancholy situation, Faber, Laynez, and the rest spent that night in prayer; and the next morning Xavier found the cords broken out of the flesh. The holy company joined in actions of thanksgiving to the Almighty, and cheerfully pursued their journey, in which Xavier served the rest on all occasions, being always beforehand with them in the duties of charity. They arrived at Venice on the 8th of January, 1537, and were much comforted to meet there St. Ignatius, by whose direction they divided themselves to serve the poor in two hospitals in that city, whilst they waited for an opportunity to embark for Palestine. Xavier, who was placed in the hospital of the incurables, employed the day in dressing the sores of the sick, in making their beds, and serving them in meaner offices, and passed whole nights in watching by them. It was his delight chiefly to attend those who were sick of contagious distempers, or infected with, loathsome ulcers. Two months had passed away in these exercises of charity, when St. Ignatius, who stayed behind alone at Venice, sent his companions to Rome, to ask the blessing of his holiness Paul III for their intended voyage. The pope granted those among them who were not in holy orders, a licence to receive them at the hands of any Catholic bishop. Upon their return to Venice, Xavier was ordained priest upon St. John Baptist's day, in 1537, and they all made vows of chastity and poverty before the pope's nuncio. Xavier retired to a village, about four miles from Padua, where, to prepare himself for saying his first mass, he spent forty days in a poor, ruined, abandoned cottage, exposed to all the injuries of the weather, lay on the ground, fasted rigorously, and subsisted on what scraps of bread he begged from door to door. St. Ignatius having caused all his company to resort to Vicenza, Xavier, after this retreat, repaired thither, and said there his first mass with tears flowing in such abundance that his audience could not refrain from mixing their own with his. By order of St. Ignatius, he applied himself to the exercises of charity and devotion at Bologna, to the great edification of that city. The house in which he there dwelt as a poor man, was afterwards given to the society, and converted into an oratory of great devotion. In Lent, in 1538, our saint was called by St. Ignatius to Rome, where the fathers assembled together to deliberate about the foundation of their Order, and their consultations were accompanied by fervent prayers, tears, watchings and penitential austerities, which they practised with a most ardent desire of pleasing our Lord alone, and of seeking in all things his greater glory and the good of souls. After waiting a whole year to find on opportunity of passing into Palestine, and finding execution of that design impracticable, on account of the war between the Venetians and the Turks, St. Ignatius and his company offered themselves to his holiness, to be employed as he should judge most expedient in the service of their neighbour. The pope accepted their offer, and ordered them to preach and instruct in Rome till he should otherwise employ them. St. Francis exercised his functions in the Church of St. Laurence, in Damaso, in which he appeared so active, that no one distinguished himself by a more ardent charity, or a more edifying zeal. Govea, a Portuguese, formerly president of the college of St. Barbara, at Paris, happened to be then at Rome, whither John III, King of Portugal, had sent him on some important business. He had formerly known Ignatius, Xavier, and Faber at Paris, and been a great admirer of their virtue; and he became more so at Rome, insomuch, that he wrote to his master, that men so learned, humble, charitable, inflamed with zeal, indefatigable in labour, lovers of the cross, and who aimed at nothing but the honour of God, were fit to be sent to plant the faith in the East Indies [India]. The king wrote thereupon to Don Pedro Mascaregnas, his ambassador at Rome, and ordered him to obtain six of these apostolic men for this mission. St. Ignatius could grant him only two, and pitched upon Simon Rodriguez, a Portuguese, and Nicholas Bobadilla, a Spaniard. The former went immediately by sea to Lisbon; Bobadilla, who waited to accompany the ambassador, fell sick, and by an overruling supernatural direction, Francis Xavier was substituted in his room, on the day before the ambassador began his journey. Our saint received this order with joy, and when he went to ask the benediction of Paul III there shone, through a profound humility, such a magnanimity of soul, that his holiness took from thence a certain presage of the wonderful events which followed. The saint left Rome with the ambassador on the 15th of March, 1540, and, on the road, found perpetual occasion for the most heroic actions of humility, mortification, charity, zeal, and piety, and was always ready to serve his fellow-travellers in the meanest offices, as if he had been everybody's servant. The journey was performed all the way by land, over the Alps and Pyreneans, and took up more than three months. At Pampelona, the ambassador pressed the saint to go to the castle of Xavier, which was but a little distant from the road, to take leave of his mother, who was yet living, and of his other friends, whom he would probably never more see in this world. But the saint would by no means turn out of the road, saying, that he deferred the sight of his relations till he should visit them in heaven; that this transient view would be accompanied with melancholy and sadness, the products of last farewells, whereas their meeting in heaven would be for eternity, and without the least alloy of sorrow. This wonderful disengagement from the world exceedingly affected Mascaregnas, who, by the saintly example and instructions of the holy man, was converted to a new course of life. They arrived at Lisbon about the end of June, and Francis went immediately to F. Rodriguez, who was lodged in an hospital, in order to attend and instruct the sick. They made this place their ordinary abode, but catechised and instructed in most parts of the town, and were taken up all Sundays and holidays in hearing confessions at court; for the king and a great number of the courtiers were engaged by their discourses to confess and communicate every week, which they chose to do at their hands. F. Rodriguez was retained by the king at Lisbon, and St. Francis was obliged to stay there eight months, while the fleet was getting ready to sail in spring. Dr. Martin d'Azpilcueta, commonly called the Doctor of Navarre, who was uncle to Xavier by the mother's side, was then chief professor of divinity at Coimbra, and wrote several letters to our saint, but could not engage him to go to Coimbra. St. Francis, when he left Rome, put a memorial in the hands of F. Laynez, in which he declared that he approved the rules that should be drawn up by Ignatius, and consecrated himself to God by the vows of poverty, chastity, and obedience, in the Society of Jesus, when it should be confirmed as a religious Order by the apostolic see. At Lisbon, before he went on board, the king delivered to him four briefs from the pope; in two of which his holiness constituted Xavier apostolic nuncio, with ample power and authority; in the third, he recommended him to David, Emperor of Ethiopia; and in the fourth to other princes in the East. No importunities of the king or his officers could prevail on the saint to accept of any provisions or necessaries, except a few books for the use of converts. Nor would he consent to have a servant, saying, that as long as he had the use of his two hands he never would take one. When he was told that it would be unbecoming to see an apostolic legate dressing his own victuals, and washing his own linen on the deck, he said he could give no scandal so long as he did no ill. The saint had two companions to the Indies, F. Paul de Camarino, an Italian Jesuit, and Francis Mansilla, a Portuguese, who was not yet in priest's orders. The saint set sail on the 7th of April, in the year 1541, the thirty-sixth of his age, on board the admiral's vessel, which carried Don Martin Alfonso de Sousa, General-Governor of the Indies, who went with five ships to take possession of his government. The admiral's vessel contained at least a thousand persons, whom Francis considered as committed to his care. He cathechized the sailors, preached every Sunday before the main-mast, took care of the sick, converted his cabin into an infirmary, lay on the deck, and lived on charity during the whole voyage, though the governor was very urgent with him to eat at his table, or accept of a regular supply of food from his kitchen; but he always answered that he was a poor religious man, and that, having made a vow of poverty, he was resolved to keep it. He, indeed, received the dishes which the governor sent him from his table, but divided the meat among those who had most need. He composed differences, quelled murmuring, checked swearing and gaming, and took the utmost care to remove all disorders. Bad actions he reproved with so much authority that nobody resisted him, and with so much sweetness and tender love that no one was offended at him. The insufferable colds of Cape Verd, the heats of Guinea, the stench of the fresh waters, and the putrefaction of their flesh provisions under the line, produced pestilential fevers, and violent scurvies. After five months of perpetual navigation, and doubling the Cape of Good Hope, they arrived at Mozambique, on the eastern coast of Africa, about the end of August, and there they wintered. The inhabitants are mostly Mahometans, and trade with the Arabs and Ethiopians; but the Portuguese have settlements among them. The air is very unwholesome, and Xavier himself fell sick there, but was almost recovered when the admiral again put to sea in a fresh vessel which made better sail, on the 15th of March, in 1542. In three days they arrived at Melinda, a town of the Saracens, in Africa. Leaving this place, after a few days' sail they touched at the isle of Socotora, over against the strait of Mecca. Thence, crossing the sea of Arabia and India, they landed at Goa, on the 6th of May, in 1542, in the thirteenth month from their setting out from Lisbon. After St. Francis was landed, he went immediately to the hospital, and there took his lodging; but would not enter upon his missionary functions till he had paid his respects to the Bishop of Goa, whose name was John d'Albuquerque, and who was a most virtuous prelate. The saint presented to him the briefs of Paul III, declared that he pretended not to use them without his approbation, and casting himself at his feet, begged his blessing. The bishop was struck with the venerable air of sanctity that appeared in his countenance and deportment, raised him up, kissed the briefs, and promised to support him by his episcopal authority, which he failed not to do. To call down the blessing of heaven on his labours, St. Francis consecrated most of the night to prayer. The situation in which religion then was in those parts was such as called forth his zeal and his tears. Among the Portuguese, revenge, ambition, avarice, usury, and debauchery seemed to have extinguished in many the sentiments of their holy religion; the sacraments were neglected; there were not four preachers in all the Indies; nor any priests without the walls of Goa. The bishop's exhortations and threats were despised, and no dam was sufficient to stem such a deluge. The infidels resembled rather beasts than men, and the few who were come over to the faith, not being supported by competent instructions, nor edified by example, relapsed into their ancient manners and superstitions. Such was the deplorable situation of those countries, when St. Francis Xavier appeared among them as a new star to enlighten so many infidel nations. So powerful was the word of God in his mouth, and such the fruit of his zeal, that in the space of ten years he established the empire of Jesus Christ in a new world. Nothing more sensibly afflicted him, at his arrival at Goa, than the scandalous deportment of the Christians, who lived in direct opposition to the gospel which they professed, and, by their manners alienated the infidels from the faith; he therefore thought it would be best to open his mission with them. In order to compass a general reformation, he began by instructing them in the principles of religion, and forming the youth to the practice of sincere piety. Having spent the morning in assisting and comforting the distressed in the hospitals and prisons, he walked through all the streets of Goa, with a bell in his hand, summoning all masters, for the love of God, to send their children and slaves to catechism. The little children gathered together in crowds about him, and he led them to the church, and taught them the creed and practices of devotion, and impressed on their tender minds strong sentiments of piety and religion. By the modesty and devotion of the youth, the whole town began to change its face, and the most abandoned sinners began to blush at vice. After some time, the saint preached in public, and made his visits to private houses; and the sweetness of his behaviour and words, and his charitable concern for the souls of his neighbours, were irresistible. Sinners were struck with the horror of their crimes, and throwing themselves at his feet, confessed them with bitter compunction of heart; and the fruits of penitence which accompanied their tears were the certain proofs of the sincerity of their conversions. Usurious bonds were cancelled, restitution was made of unjust gains, slaves who had been unjustly acquired were set at liberty, concubines dismissed or lawfully married, and families were well regulated. He had laboured about fifteen months in the conversion of the Paravas, when, toward the close of the year 1543, he was obliged to return to Goa to procure assistants. The seminary of the faith which had been founded there for the education of young Indians, was committed to his care, and put into the hands of the Society. The saint enlarged it, and made prudent regulations for the government and direction of the youth; and, from this time, it was called the seminary of St. Paul. The following year he returned to the Paravas with a supply of evangelical labourers, as well Indians as Europeans, whom he stationed in different towns; and some he carried with him into the kingdom of Travancor, where, as he testifies in one of his letters, he baptized ten thousand Indians with his own hand in one month, and some times a whole village received the sacrament of regeneration in one day. When the holy man first penetrated into the inland provinces of the Indians, being wholly ignorant of the language of the people, he could only baptize children, and serve the sick, who, by signs, could signify what they wanted, as he wrote to F. Mansilla. Whilst he exercised his zeal in Travancor, God first communicated to him the gift of tongues, according to the relation of a young Portuguese of Coimbra, named Vaz, who attended him in many of his journies. He spoke very well the language of those barbarians without having learned it, and had no need of an interpreter when he instructed them. He sometimes preached to five or six thousand persons together, in some spacious plain. The saint narrowly escaped the snares which were sometimes laid by Bramins and others to take away his life; and, when the Badages, a tribe of savages and public robbers, having plundered many other places, made inroads into Travancor, he marched up to the enemy, with a crucifix in his hand, at the head of a small troop of fervent Christians, and, with a commanding air, bade them, in the name of the living God, not to pass further, but to return the way they came. His words cast such a terror into the minds of the leaders who were at the head of the barbarians, that they stood some time confounded, and without motion; then retired in disorder, and quitted the country. This action procured St. Francis the protection of the King of Travancor, and the surname of the Great Father. As the saint was preaching one day at Coulon, a village in Travancor, near Cape Comorin, perceiving that few were converted by his discourse, he made a short prayer that God would honour the blood and name of his beloved Son, by softening the hearts of the most obdurate. Then he bade some of the people open the grave of a man who was buried the day before, near the place where he preached; and the body was beginning to putrify with a noisome scent, which he desired the by-standers to observe. Then falling on his knees, after a short prayer, he commanded the dead man in the name of the living God to arise. At these words the dead man arose, and appeared not only living, but vigorous, and in perfect health. All who were present were so struck with this evidence, that throwing themselves at the saint's feet, they demanded baptism. The holy man also raised to life, on the same coast, a young man who was a Christian, whose corpse he met as it was carried to the grave. To preserve the memory of this wonderful action, the parents of the deceased, who were present, erected a great cross on the place where the miracle was wrought. These miracles made so great impressions on the people, that the whole kingdom of Travancor was subjected to Christ in a few months, except the king and some of his courtiers. The reputation of the miracles of St. Francis reached the isle of Manar, which sent deputies to St. Francis, entreating him to visit their country. The saint could not at that time leave Travancor, but sent a zealous missionary, by whom many were instructed and baptized. The King of Jafanatapan, in the northern part of the neighbouring beautiful and pleasant isle of Ceylon, hearing of this progress of the faith, fell upon Manar with an army, and slew six or seven hundred Christians, who, when asked the question, boldly confessed Christ. This tyrant was afterwards slain by the Portuguese, when they invaded Ceylon. The saint, after he had made a journey to Cochin, upon business, visited Manar, and settled there a numerous church; in a journey of devotion, which he took to Meliapor, to implore the intercession of the apostle St. Thomas, he converted many dissolute livers in that place. Afterwards, intending to pass to the island of Macassar, he sailed to Malacca, a famous mart, in the peninsula beyond the Ganges, to which all the Indies, and also the Arabs, Persians, Chinese, and Japonians, resorted for trade. The saint arrived here on the 25th of September, 1545, and, by the irresistible force of his zeal and miracles, reformed the debauched manners of the Christians, and converted many pagans and Mahometans. This town had been lately possessed by a tribe of the latter sect, who had wrested it from the King of Siam; but Albuquerque had conquered it in 1511. St. Francis, finding no opportunity of sailing to Macassar, passed the isles of Bonda, which are some of the Spice Islands. Landing in the island of Amboina, he baptized great part of the inhabitants. Having preached in other islands, he made a considerable stay in the Moluccas, and, though the inhabitants were an untractable people, he brought great numbers to the truth. Thence he passed to the isle del Moro, the inhabitants of which he gained to Christ. In this mission he suffered much; but from it wrote to St. Ignatius, “The dangers to which I am exposed, and pains I take for the interest of God alone, are the inexhaustible springs of spiritual joys; insomuch, that these islands, bare of all worldly necessaries, are the places in the world for a man to lose his sight with the excess of weeping; but they are tears of joy. I remember not ever to have tasted such interior delights; and these consolations of the soul are so pure, so exquisite, and so constant, that they take from me all sense of my corporal sufferings.” The saint, returning towards Goa, visited the islands on the road where he had preached, and arrived at Malacca in 1547. In the beginning of the year 1548 he landed in Ceylon, where he converted great numbers, with two kings. At Malacca, a Japanese, named Angeroo, addressed himself to the saint. Kaempfer tells us that he had killed a man in his own country, and, to save his life, made his escape in a Portuguese ship. All agree that he was rich, and of a noble extraction, and about thirty-five years of age; and, that being disturbed in mind, with remorse and terrors of conscience, he was advised by certain Christians to have recourse to the holy St. Francis for comfort. The saint poured the mildest balm into his wounded heart, and gave him assurances that he should find repose of mind, but must first seek God in his true religion. The Japanese was charmed with his discourses, and as he had by that time acquired some knowledge of the Portuguese language, was instructed in the faith, and engaged by St. Francis to embark with his attendants and go to Goa, whither he himself was directing his course, but taking a round. In the straits of Ceylon, the ship which carried the saint was overtaken with a most dreadful tempest, insomuch, that the sailors threw all their merchandise overboard, and the pilot, not being able to hold the rudder, abandoned the vessel to the fury of the waves. For three days and three nights, the mariners had nothing but death before their eyes. St. Francis, after hearing the confessions of all on board, fell on his knees before his crucifix, and continued there, wholly taken up and lost to all things but to God. The ship at last struck against the sands of Ceylon, and the mariners gave themselves up for lost, then Xavier, coming out of his cabin, took the line and plummet, as if it had been to fathom the sea, and, letting them down to the bottom of the water, pronounced these words, “Great God, Father, Son, and Holy Ghost, have mercy on us.” At the same moment, the vessel topped, and the wind ceased. After which they pursued their voyage, and happily arrived at Cochin, on the 21st of January, 1548. The saint, leaving Cochin, visited the villages of the coast of the pearl fishery, and was much edified with the fervour of the converts; he made some stay at Manapar, near Cape Comorin, passed over to the isle of Ceylon, where he converted the King of Cande, and arrived at Goa on the 20th of March, 1548. There he instructed Angeroo and many others, and took a resolution to go to Japan. In the mean time, he applied himself more than ever to the exercises of an interior life, as it were to recover new strength; for it is the custom of all apostolical men, by the communications which they have with God, to refresh themselves, and repair their interior spirit amidst the pains which they take with their neighbour. During this retirement, in the garden of St. Paul's college, sometimes walking, at other times in a little hermitage which was there set up, he cried out, “It is enough, my Lord; it is enough.” And he sometimes opened his cassock before his breast, declaring he was not able to support the abundance of heavenly consolations. At the same time, he signified that he rather prayed that God would reserve those pleasures for another time, and here would not spare to inflict on him any pains or sufferings in this present world. These interior employments did not hinder him from the labours of his ministerial vocation, nor from succouring the distressed in the hospitals and in the prisons. On the contrary, the more lively and ardent the love of God was in him, the more desirous he was to bring it forth, and kindle it in others. This charity caused him often to relinquish the delights of holy solitude. F. Gaspar Barzia, and four other Jesuits, arrived at that time at Goa from Europe, whom the saint stationed, and then set out for Malacca, intending to proceed to Japan. After a short stay at Malacca, he went on board a Chinese vessel, and arrived at Cangoxima, in the kingdom of Saxuma, in Japan, on the 15th of August, 1549, having with him Angeroo, who had been baptized with two of his domestics at Goa, and was called Paul of the holy faith. The language of the Japanese seems, in the judgment of Kaempfer, to be a primitive or original tongue; for it has no affinity with other oriental languages, though certain Chinese terms are adopted in it. St. Francis learned certain elements of it from his convert during his voyage, and stayed forty days at Cangoxima, lodging at Paul's house, whose wife, daughter, and other relations he in the mean time converted and baptized. The same language is used all over the empire, but the words are differently accented when addressed to courtiers or persons of rank, and when to merchants and soldiers, and again differently to the vulgar. During these forty days, St. Francis, by unwearied application, made such progress in it as to translate into Japanian the apostle's creed, and an exposition of it which he had composed, and which he got by heart in this language, and then began to preach; but was first introduced by Paul to the King of Saxuma, whose residence was six leagues from Cangoxima. Meeting with a most gracious and honourable reception, he obtained the king's leave to preach the faith to his subjects; of which he made so good use that he converted a great number. After a year spent at Cangoxima, with his usual success, the saint, in 1550, went to Firando, the capital of another petty kingdom; for the King of Saxuma, incensed at the Portuguese because they had abandoned his port to carry on their trade chiefly at Firando, had withdrawn the license he had granted the saint, and began to persecute the Christians. The converts, however, persevered steady, and declared they were ready to suffer banishment or death rather than deny Christ; and St. Francis recommended them to Paul, and left in their hands an ample exposition of the creed, and the life of our Saviour, translated entire from the gospels, which he had caused to be printed in Japanese characters. He took with him his two companions, who were Jesuits, and carried on his back, according to his custom, all the necessary utensils for the sacrifice of the mass. The saint, in his way to Firando, preached in the fortress of Ekandono, the prince of which was a vassal to the King of Saxuma. The prince's steward embraced the faith with several others, and to his care Xavier recommended the rest at his departure; and he assembled them daily in his apartments to recite with them the litany and prayers, and, on Sundays, read to them the Christian doctrine: and so edifying was the behaviour of these Christians, that many others desired to join them, after the departure of their apostle; and the King of Saxuma, moved by their edifying conduct, became again the protector of our holy religion. At Firando, Xavier baptized more infidels in twenty days than he had done at Cangoxima in a whole year. These converts he left under the care of one of the Jesuits that accompanied him, and set out for Meaco with one Jesuit, and two Japanian Christians. They went by sea to Facata, and from thence embarked for Amanguchi, the capital of the kingdom of Naugato, famous for the richest silver mines in Japan. Our saint preached herein public, and before the king and his court; but the gospel at that time took no root in this debauched city, the number which the saint gained there being inconsiderable, though a single soul is, indeed, a great acquisition. Xavier, having made above a month’s abode at Amanguchi, and gathered small fruit of his labours, except affronts, continued his journey towards Meaco, with his three companions. It was towards the end of December, and the four servants of God suffered much on the road from heavy rains, great drifts of snow, pinching cold, torrents, and hideous mountains and forests; and they travelled barefoot. In passing through towns and villages, Xavier was accustomed to read some part of his catechism to the people, and to preach. Not finding a proper word in the Japanian language to express the sovereign Deity, and, fearing lest the idolaters should confound God with some of their idols, he told them, that having never had any knowledge of the true infinite God, they were not able to express his name, but that the Portuguese called him Deos; and this word he repeated with so much action, and such a tone of voice, that he made even the pagans sensible what veneration is due to that sacred name. In two several towns he narrowly escaped being stoned for speaking against the gods of the country. He arrived at Meaco, with his companions, in February, 1551. The Dairi, Cubosama, and Saso (or high priest), then kept their court there; but the saint could not procure an audience even of the Saso without paying for that honour a hundred thousand caixes, which amount to six hundred French crowns, a sum which he had not to give. A civil war, kindled against the Cubosama, filled the city with such tumults and alarms, that Xavier saw it to be impossible to do any good there at that time, and, after a fortnight's stay, returned to Amanguchi. Perceiving that he was rejected at court upon the account of his mean appearance, he bought a rich suit, and hired two or three servants; and in this equipage waited on the king, to whom he made a present of a little striking-clock, and some other things. Thus he obtained his protection, and preached with such fruit, that he baptized three thousand persons in that city, with whom he left two Jesuits, who were his companions, to give the finishing to their instruction. At Amanguchi God restored to St. Francis the gift of tongues; for he preached often to the Chinese merchants who traded there, in their mother-tongue, which he had never learned. Sanctity, meekness, and humility, are often more powerful in a preacher than the evidence of miracles. By the heroic example of these virtues the apostles converted the world, and by the like did our saint soften the hearts of many hardened infidels. St. Francis, recommending the new Christians here to two fathers whom he left behind, left Amanguchi, toward the middle of September, in 1551, and, with two Japanian Christians, who had suffered with joy the confiscation of their goods for changing their religion, travelled on foot to Fuceo, the residence of the King of Bungo, who was very desirous to see him, and gave him a most gracious reception. Here the saint publicly confuted the Bonzas, who, upon motives of interest, every where strenuously opposed his preaching, though, even among them, some were converted. The saint's public sermons and private conversations had their due effect among the people, and vast multitudes desired to be instructed and baptized. Among others, the king himself was convinced of the truth, and renounced those impurities which are abhorred by nature, but remained still wedded to some sensual pleasures, on which account he could not be admitted to the sacrament of regeneration, till, after some succeeding years, having made more serious reflections on the admonitions of the saint, he reformed his life altogether, and was baptized. Our saint took leave of this king, and embarked to return to India, on the 20th of November, 1551, having continued in Japan two years and four months. To cultivate this growing mission, he sent thither three Jesuits, who were shortly followed by others. It had been often objected to him that the learned and wise men in China had not embraced the faith of Christ. This circumstance first inspired him with an earnest desire that the name of Christ might be glorified in that flourishing empire; and, full of a zealous project of undertaking that great enterprise, he left Japan. In this voyage the ship in which he sailed was rescued, from imminent danger of shipwreck in a storm by his prayers; and a shallop, in which were fifteen persons belonging to the ship, from which it had been separated by the same tempest, was saved by the same means, according to his confident and repeated prediction, the passengers and mariners in it seeming all the way to have seen Xavier sitting at the helm and steering it. Many other clear predictions of the saint are recorded. At Malacca he was received with the greatest joy that can be imagined, and he immediately set himself to contrive how he might compass his intended journey to China. The greatest difficulty was, that besides the ill-understanding which was betwixt China and Portugal, it was forbidden to strangers, on pain of death, or of perpetual imprisonment, to set foot in that kingdom. To remove this obstacle, St. Francis discoursed with the old governor of Malacca, Don Pedro de Sylva, and with the new one, Don Alvarez d'Atayda, and it was agreed that an embassy might be sent in the name of the King of Portugal to China to settle a commerce, with which the saint might with safety land in that kingdom. In the mean time the saint set out for Goa. Xavier reached Goa in the beginning of February, and having paid a visit to the hospitals, went to the College of St. Paul, where he cured a dying man. The missionaries whom he had dispersed before his departure, had spread the gospel on every side. F. Gaspar Barzia had converted almost the whole city and island of Ormuz. Christianity flourished exceedingly on the coast of the pearl fishery, and had made great progress at Cochin, Coulan, Bazain, Meliapor, in the Moluccas, the isles of Moro, &c. The King of Tanor, whose dominions lay on the coast of Malabar, had been baptized at Goa. The King of Trichenamalo, one of the sovereigns of Ceylon, also embraced the faith. The progress of the faith in many other places was such as gave the greatest subject of joy to the holy man. But F. Antonio Gomez, a great preacher and scholar, whom the saint had appointed rector at Goa, had made such changes and innovations, even in the domestic discipline of the Society, that the saint was obliged to dismiss him from the Order. Xavier appointed F. Barzia, a person of eminent piety, rector of Goa and vice-provincial, sent new preachers into all the missions on this side the Ganges, and obtained of the viceroy, Don Alphonso de Norogna, a commission for his good friend, James Pereyra, to go on an embassy to China. Having settled all affairs at Goa, he made the most tender and ardent exhortations to his religious brethren, then leaving F. Barzia vice-provincial, set sail on the 14th of April, in 1552, and landing at Malacca, found the town afflicted with a most contagious pestilential fever. This he had foretold before he arrived; and no sooner was he come on shore, but running from street to street, he carried the poor that lay languishing, up and down to the hospitals, and attended them with his companions. At that time he restored to life a young man, named Francis Ciavos, who afterwards took the habit of the Society. When the mortality had almost ceased, the saint treated about the embassy to China with the Governor of Malacca, on whom Don Alphonso de Norogna (the fifth Viceroy and seventeenth Governor of the Indies) had reposed the trust of that affair. Don Alvarez d'Atayda Gama had lately succeeded his good brother, Don Pedro de Sylva Gama, in the government of Malacca. This officer, out of a pique to Pereyra, crossed the project of the embassy, and, when St. Francis urged the authority of the king, and the command of the viceroy, Alvarez flew into a rage, and treated him with the most injurious language. The saint ceased not for a whole month to solicit the governor, and at length threatened him with excommunication in case he persisted thus to oppose the propagation of the gospel. Upon this occasion the saint produced the briefs of Paul III, by which he was appointed apostolic nuncio, which, out of humility, he had kept a profound secret during ten years that were expired since his coming to the Indies. The governor continued to laugh at the threats, so that the bishop's grand-vicar at length fulminated an excommunication against him in the name of Xavier, who seeing this design utterly destroyed, determined to go on board of a Portuguese ship that was setting sail for the isle of Sancian, a small barren island near Macao, on the coast of China. This governor was afterwards deposed for extortions and other crimes, by an order of the king, and sent in chains to Goa. 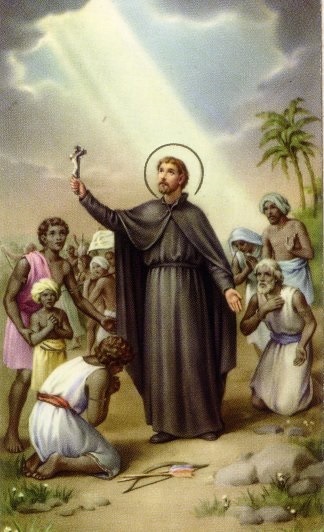 St. Francis during this voyage wrought several miracles, and converted certain Mahometan passengers, and on the twenty-third day after the ship's departure from Malacca, arrived at Sancian, where the Chinese permitted the Portuguese to come and buy their commodities. When the project of the embassy had failed, St. Francis had sent the three Jesuits he had taken for his companions into Japan, and retained with him only a brother of the Society (who was a Chinese, and had taken the habit at Goa) and a young Indian. He hoped to find means with only two companions to land secretly in China. The merchants at Sancian endeavoured to persuade him that his design was impracticable, all setting before his eyes the rigorous laws of the government of China, that all the ports were narrowly guarded by vigilant officers, who were neither to be circumvented nor bribed, and that the least he could expect was scourging and perpetual imprisonment. The saint was not to be deterred; and answered all these and many other reasons, saying, that to be terrified by such difficulties from undertaking the work of God, would be incomparably worse than all the evils with which they threatened him. He therefore took his measures for the voyage of China, and first of all provided himself with a good interpreter; for the Chinese he had brought with him from Goa was wholly ignorant of the language which is spoken at the court, and had almost forgotten the common idiom of the vulgar. Then the saint hired a Chinese merchant, called Capoceca, to land him by night on some part of the coast where no houses were in view; for which service Xavier engaged to pay him two hundred pardos, and bound himself by oath that no torments should ever bring him to confess either the name or house of him who had set him on shore. The Portuguese at Sancian, fearing this attempt might be revenged by the Chinese on them, endeavoured to traverse the design. Whilst the voyage was deferred Xavier fell sick, and when the Portuguese vessels were all gone except one, was reduced to extreme want of all necessaries. Also, the Chinese interpreter whom he had hired, recalled his word. Yet the servant of God, who soon recovered of his illness, did not lose courage; and hearing that the King of Siam was preparing a magnificent embassy to the Emperor of China, he resolved to use his best endeavours to obtain leave to accompany the ambassador of Siam. But God was pleased to accept his will in this good work, and took him to himself. A fever seized the saint a second time on the 20th of November, and at the same time he had a clear knowledge of the day and hour of his death, which he openly declared to a friend, who afterwards made an authentic deposition of it by a solemn oath. From that moment he perceived in himself a strange disgust of all earthly things, and thought on nothing but that celestial country whither God was calling him. Being much weakened by his fever, he retired into the vessel which was the common hospital of the sick, that he might die in poverty. But the tossing of the ship giving him an extraordinary headache, and hindering him from applying himself to God as he desired, the day following he requested that he might be set on shore again, which was done. He was exposed on the sands to a piercing north wind; till George Alvarez, out of compassion, caused him to be carried into his cabin, which afforded a very poor shelter, being open on every side. The saint's distemper, accompanied with an acute pain in his side, and a great oppression, increased daily; he was twice blooded, but the unskilful surgeon both times pricked the tendon, by which accident the patient fell into swooning convulsions. His disease was attended with a horrible nauseousness, insomuch that he could take no nourishment. But his countenance was always serene, and his soul enjoyed a perpetual calm. Sometimes he lifted up his eyes to heaven, and at other times fixed them on his crucifix, entertaining divine conversations with his God, in which he shed abundance of tears. At last, on the 2nd of December, which fell on Friday, having his eyes all bathed in tears, and fixed with great tenderness of soul upon his crucifix, he pronounced these words, “In thee, O Lord, I have hoped; I shall not be confounded for ever;” and, at the same instant, transported with celestial joy, which appeared upon his countenance, he sweetly gave up the ghost, in 1552. Though he was only forty-six years old, of which he had passed ten and a half in the Indies, his continual labours had made him grey betimes, and in the last year of his life he was grizzled almost to whiteness. His corpse was interred on Sunday, being laid after the Chinese fashion, in a large chest, which was filled up with unslacked lime, to the end that the flesh being consumed, the bones might be carried to Goa. On the 17th of February, in 1553, the grave was opened to see if the flesh was consumed; but the lime being taken off the face, it was found ruddy and fresh coloured, like that of a man who is in a sweet repose. The body was in like manner whole, and the natural moisture uncorrupted; and the flesh being a little cut in the thigh, near the knee, the blood was seen to run from the wound. The sacerdotal habits in which the saint was buried, were in no way endamaged by the lime; and the holy corpse exhaled an odour so fragrant and delightful, that the most exquisite perfumes came nothing near it. The sacred remains were carried into the ship, and brought to Malacca on the 22nd of March, where it was received with great honour. The pestilence which for some weeks had laid waste the town, on a sudden ceased. The body was interred in a damp churchyard; yet in August was found entire, fresh, and still exhaling a sweet odour, and being honourably put into a ship, was translated to Goa, where it was received, and placed in the church in the college of St. Paul, on the 15th of March, in 1554; upon which occasion several blind persons recovered their sight, and others, sick of palsies and other diseases, their health, and the use of their limbs. By order of King John III a verbal process of the life and miracles of the man of God was made with the utmost accuracy at Goa, and in other parts of the Indies. Many miracles were wrought, through his intercession, in several parts of the Indies and Europe, confessed by several Protestants; and Tavernier calls him the St. Paul, and the true apostle of the Indies. St. Francis was beatified by Paul V, in 1554, and canonized by Gregory XV, in 1662. By an order of John V, King of Portugal, the Archbishop of Goa, attended by the viceroy, the Marquis of Castle Nuovo, in 1744, performed a visitation of the relics of St. Francis Xavier; at which time the body was found without the least bad smell, and seemed environed with a kind of shining brightness; and the face, hands, breast, and feet had not suffered the least alteration, or symptom of corruption. In 1747, the same king obtained a brief of Benedict XIV, by which St. Francis Xavier is honoured with the title of patron and protector of all the countries in the East Indies. Holy zeal may properly be said to have formed the character of St. Francis Xavier. Consumed with an insatiable thirst of the salvation of souls, and of the dilatation of the honour and kingdom of Christ on earth, he ceased not with tears and prayers to conjure the Father of all men not to suffer those to perish whom he had created in his own divine image, made capable of knowing and loving him, and redeemed with the adorable blood of his Son; as is set forth in the excellent prayer of this saint, printed in many books of devotion. For this end the saint, like another St. Paul, made himself all to all, and looked upon all fatigues, sufferings, and dangers, as his pleasure and gain. In transports of zeal he invited and pressed others to labour in the conversion of infidels and sinners. In one of his letters to Europe, he wrote as follows: “I have often thoughts to run over all the universities of Europe, and principally that of Paris, and to cry aloud to those who abound more in learning than in charity, ‘Ah! how many souls are lost to heaven through your neglect!’ Many, without doubt, would be moved, would make a spiritual retreat, and give themselves the leisure for meditating on heavenly things. They would renounce their passions, and, trampling under foot all worldly vanities, would put themselves in a condition of following the motions of the divine will. Then they would say, Behold me in readiness, O Lord. How much more happily would these learned men then live! With how much more assurance would they die! Millions of idolaters might be easily converted, if there were more preachers who would sincerely mind the interests of Jesus Christ, and not their own.” But the saint required missionaries that are prudent, charitable, mild, perfectly disinterested, and of so great purity of manners, that no occasions of sin weaken their constancy. “In vain,” says he, “would you commit this important employ to any, howsoever learned and otherwise qualified, unless they are laborious, mortified, and patient; unless they are ready to suffer willingly, and with joy, hunger and thirst, and the severest persecutions.” This saint was himself a model of such preachers, formed upon the spirit of the apostles. So absolute a master he was of his passions, that he knew not what it was to have the least motion of choler and impatience, and in all events was perfectly resigned to the divine will; from whence proceeded an admirable tranquillity of soul, a perpetual cheerfulness, and equality of countenance. He rejoiced in afflictions and sufferings, and said that one who had once experienced the sweetness of suffering for Christ, will ever after find it worse than death to live without a cross. By humility the saint was always ready to follow the advice of others, and attributed all blessings to their prayers, which he most earnestly implored. Of himself he always sincerely spoke as of the basest and most unworthy of men, with the most perfect sentiments of distrust in himself. The union of his soul with God by holy prayer raised him above the world. Ingulfed in deep meditations, he was sometimes found suspended in the air, with beams of glory round his countenance, as many ocular witnesses deposed.